Detective Guyton investigating the crime scene with Whiteville teens. Have you ever wanted to put on Sherlock’s hat for a day and solve an intense murder? 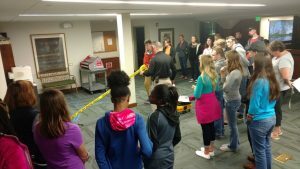 The teens at our December Café received a taste for detective work recently when Detective Ron Guyton from the Whiteville Police Department lead us through the paces of solving a mock murder that he staged. He also shared his vast colorful experience proving what it means to be a part of the investigative field. After Detective Guyton showed everyone his CSI gear for uncovering footprints, fingerprints and much more, he lead us to the scene of the crime. The first responding Patrol Officer, who was chosen from the crowd of teens, secured the scene and ensured the scene’s safety while the investigator gained control of the crime scene. 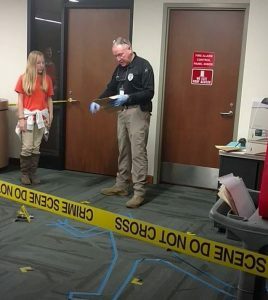 After the scene was taped off from the area around it, Detective Guyton lead the examination of the crime scene, while pointing out the key aspects like bodies, bullets, and blood. Every piece of material is marked with tags, even if it was unknown material. Photography followed the examination. The entire area and every material within the area was photographed before anything was tampered with or touched. Most of the café was the hands-on activity. After Detective Guyton secured the crime scene, gave beginning instructions and pointers on what to look for, the teens were able to join in on the process of crime scene investigation. The process involved identifying, evaluating, and collecting evidence, along with collecting testimony from witnesses, who were acted out by the café leaders. 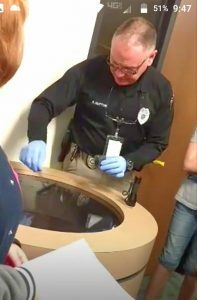 Detective Guyton picked a few teens to dust for fingerprints inside the area before sending all the evidence to be analyzed in the lab. It was all in a day’s work for busy detectives on the case! With the case on the way to be solved, our teens begin to prepare for their next hands-on café. Not only did the café engage the teens throughout the café, they learned about the thorough process that each case requires in the world of CSI. Will the next time you see yellow tape spark your interest in what lies behind, or will it inspire you to take the path of a detective?